Phantoms chief Slava Koulikov will urge his team to play like favourites every time they hit the ice this season. 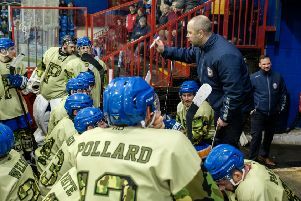 The city club begin their preparations for the National Ice Hockey League (NIHL) Division One South campaign with a pair of weekend challenge outings. They take on Basingstoke in the first annual Billy Glover Memorial clashes with a Saturday date in Hampshire (6.30pm) followed by a Sunday return fixture at Planet Ice (5.30pm). And while Koulikov is quick to insist that results are not the top priority, he is keen to see how his men acquit themselves against another team expected to challenge for honours in the sport’s new second tier. He said: “I believe Basingstoke will be a good team again - just as they have been in recent seasons. It is important to test ourselves against the best calibre of opposition that we possibly can in pre-season. “We’ve managed to keep much of our roster together and it is now about ensuring the new guys all fit in well. “We’re all looking forward to the challenge of a new season in a new league. “We’ve been underdogs and the team that over-achieved in the English Premier League in recent years. “That won’t be the case any more. We have a team that will be expected to challenge at the top end of the table. Koulikov expects to have his full roster - including new signings Leigh Jamieson, Nathan Salem, Edward Knaggs and Glenn Billing, and imports Darius Pliskauskas and Ales Padelek - available to face Basingstoke. Bison have enlisted two Czech forwards to fill their import spots. The classy Tomas Karpov will spend a fifth successive season with the Hampshire club and is joined by veteran countryman Jaroslav Cesky - a 39 year-old who lists Phantoms among his many former clubs. Cesky spent much of the 2013-14 season with the city side. Phantoms also have back-to-back games scheduled against Swindon Wildcats next weekend (September 9 and 10) before the league campaign begins with a home clash against Bracknell on Saturday, September 16.